I first noticed them outside of the car window. The flock of birds moving like synchronized swimmers or a well-choreographed dance troupe, dark flowing against the white clouds. What music did they hear? Who leds them? Who taught them such grace? I am amazed at the Creator’s wonders found in nature. I knew this phenomenon of the bird ballet had a name and being a word person knew I had to explore this mesmerizing movement. The result was not disappointment and the name wasn’t either. Isn’t that a cool word! When birds, usually starlings, fly together and swirl in a repeating, coordinated ever-changing pattern – this dazzling dance is called a murmuration. 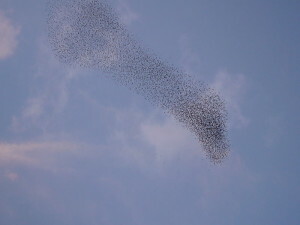 The starlings in a murmuration seem to be connected together. They twist and turn and change direction at a moment’s notice. “Each starling in a flock is connected to every other. When a flock turns in unison, it’s a phase transition. At the individual level, the rules guiding this are relatively simple. When a neighbor moves, so do you. Depending on the flock’s size and speed and its members’ flight physiologies, the large-scale pattern changes. Often they gather as night approaches. In the twilight, the dance begins with a few birds, but gradually other starlings arrive, then more and more, until they all join together in one massive flock. Their movements create incredible patterns, streams, circles, trails. Suddenly they plunge downward then swoop and sail skyward. As they twist and turn in tight formation, amazingly they swirl but never collide. Scientists don’t fully understand the how and why of murmuration. A mystery. Maybe God is dancing with them and that is unknown, there but unseen. Then I read this poem by Mary Oliver the other day. Amazing, isn’t it as you open your heart and begin to ponder something, God sends his message all over for us to notice! Oh, I wish we as humans could work together like these birds. Too often we are more like chickens, scraping only for ourselves, ruffling another person’s feathers so we feel better or superior. Lord I want to dance with you. I know I can’t change the whole world, but the optimist in me believes if I keep my eyes on Christ, maybe, just maybe, a small movement will grace the sky and inspire others to join in the cosmic dance, led by God. Lord I want to dance with you. Move when you lead. Soar where you fly. God turns. He takes the lead in this dazzling dance. My role is to immediately follow. Move when you lead. Soar where you fly. May my life be a murmuration with you. Wow, just wow…I have never seen such a beautiful and powerful sight…Thanks, Jean..so much beauty even in our broken world. Jean, this is an absolutely BEAUTIFUL piece. The video was amazing to watch; your words were amazing to read–captivating, almost poetic prose, climaxed with a lovely, poignant prayer. Yes, “may my life be a murmuration with my Father!” Write on, Jean! You are so kind, Nancy. This dance the birds do just captives my heart. Times like this I know, I know there is a God! 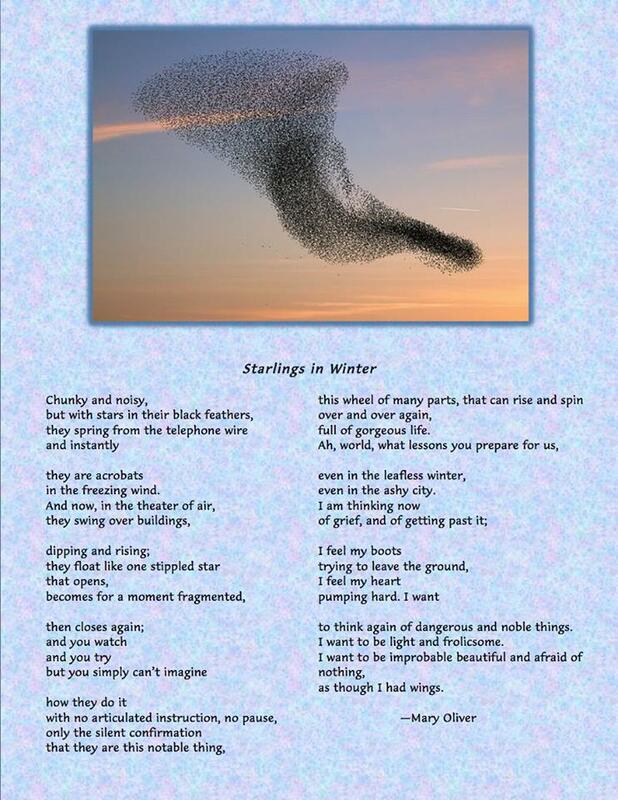 I’ve always been amazed at the flight of birds in winter. Such heavenly creatures they are. Joining you from Lyli’s place today, where we are neighbors. Hi Dayle, thanks for stopping by my blog. I too love to watch the birds this winter. Have a bird feeder right outside my office window and they entertain me all the time! Hi Tracey, Love your insight about the birds performing even if none watched. yes so true and you added to my enjoyment of this by writing that. Thanks!